HI everybody! As you may know I recently read Eliza and her Monsters by Francesca Zappia (check out my review if you want more info). It’s an amazing story about Eliza, a web comic creator who prefers her life spent online to the real world and whose friendships are purely online. She often gets criticism about this and has to defend her online friends as ‘real friendships’ constantly. It got me thinking a lot about the concept of friendship and the differences and similarities between online friendships and ‘real-life’ friendships. Especially in relationship to something close to my life and heart, the book blogging community. Because, even though not everybody may think of this the same way, I do consider you my friends. If I comment regularly on your blog, you comment on mine or we chat now and then through social media – I consider us friends. I wholeheartedly believe that online friendships are real friendships. To imply that they are not real is even a bit of an insult. Sure, you may only talk to each other on the internet, but that doesn’t make the friendship any less real or important. If anything, what brings you together is more likely a shared interest, passion or mindset as opposed to just the convenience of proximity or same age. 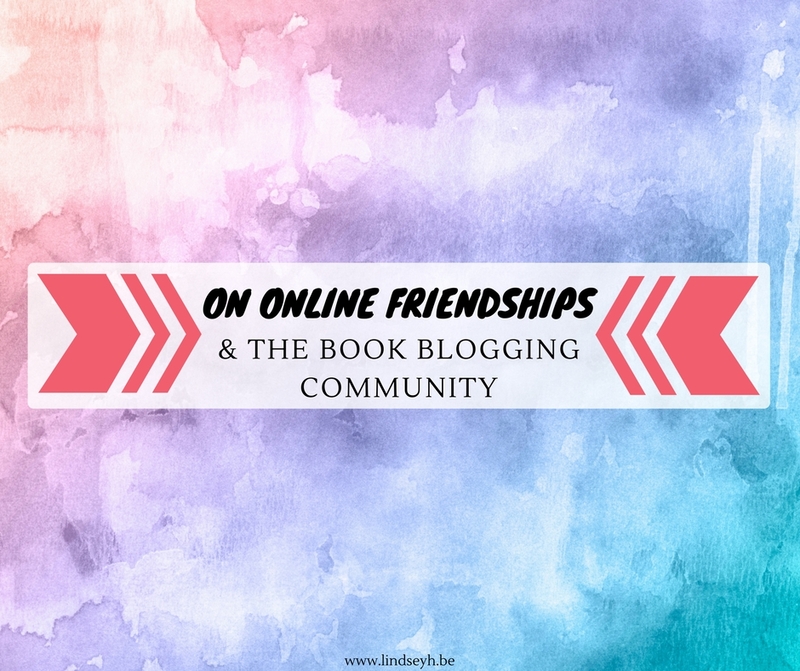 Personally, I feel like I’ve gained quite a few friends since I started book blogging and discovered the wonderful book blogging community. Do these friendships replace friendships I have made in ‘real-life’? (I don’t like calling them real-life friendships because it implies that online friendships are not real-life. So maybe I should continue calling them offline friendships instead.) No, they don’t! Offline friendships are of course still so important. Sometimes you just need a actual face-to-face chat over coffee (or tea in my case) with an offline friend. Have an offline friend to go to concerts with. Have someone know you so well they see when you are upset about something and unexpectedly show up at your door with ice cream. These kinds of things are tricky when you only know somebody online. There is nothing I love more than being understood by someone who totally gets and even shares my interests and passions. As much as I may love offline friends, they don’t always understand or even care about my love for certain things. And that’s of course okay, but on the other hand it may seem silly, but those interests are a big part of me so you can’t underestimate the power of finding someone who you can share that with. I have met amazing people through blogging, whether we talk about books, music, tv or whatever. Thank you for fangirling with me, it means the world. The beauty of making friends online is that it’s possible they live in different time zones, so you can pretty much have someone to talk to at every moment of the day. Can’t sleep? Surely there is someone online. What I love most about this is the fact that I can for example wake up to thoughtful comments or come home after an exhausting day to comments that cheer me right up. And I hope I can only do the same for all of you. Something that I noticed is that there is absolutely no guilt-tripping online (well, except maybe the guilt we talk ourselves into) when we don’t interact for a bit. Everybody is so super understanding when you say “I’m sorry I haven’t been able to comment for a bit. Life got in the way”. Never have I ever had a fellow blogger get upset with me for not commenting for a few weeks. On the other hand, the love is just as big when I do come back. And the same goes the other way around. It doesn’t matter if you haven’t commented to me in a while, seeing your comments after a few weeks still makes me just as happy. Since online friends can be come from all over the world and be different ages, nationalities or cultures, it is an amazing way of being exposed to different opinions and perspectives and I have personally learned so much from all of you. Things I wouldn’t have thought of before, issues that may not have crossed my mind, all of your posts and comments and ways of thinking have inspired me and broadened my mind on a daily basis. I love how I can share my thoughts exactly the way I want online. If I don’t want to get personal, no problem! I can talk books or music or kdrama with you and feel perfect. But I love how when I have something more personal to share, some issues that perhaps I feel like I can’t share with offline friends, I can do so online. The support I have received from you all has given me the courage to continue offline and I can’t thank you enough. Whether offline or online, friendship is friendship. The two kinds of friendships complement each other wonderfully and are both valid and important. What are your thoughts on online friendships? I think of online friendships the same way! And as strange as it sounds, I almost talk to my blogging friends more than my offline friends just because my life is so busy and by the time I get around to talking to people, it’s one in the morning (and for some reason, it’s considered rude to show up at someone’s door when they’re sleeping to rant about Star Wars and Sarah J. Maas. So strange!) so, like you said, the best option is to just go online and have a chat with some of my blogging friends. I also love that there’s so much love in the blogging community, like you said! You can scroll through so many other communities and there always seem to be more bad apples than in the blogging community. I don’t know if book and lifestyle nerds are just more forgiving than other people but it’s lovely and I’m so glad I got involved in the community 🙂 I’m a new subscriber (I love your blog design, by the way!) and I’m looking forward to reading more of your posts and chatting with you, Lindsey! I love this post! I love that I have become a part of this community that loves books as much as I do. I think these online friendships are just as important as real-life friendships; they’re just a bit different! I feel like I’ve gotten to know a group of bloggers pretty well, and we all support each other and look forward to that interaction. And I agree, sometimes it’s easier to talk about things online than offline. I wholeheartedly agree with you here. Online friendships are just as valid as friendships you make offline. Especially for people that aren’t very good with socializing – online friends have been there for me more than friends I’ve made irl. Great post! I think my online friendships are just as valid as real-life friendships. I like my online friends because there’s almost always someone online when I am. It would be rude to call a real-life friend in the middle of the night, but if I can’t sleep, I can talk to someone in Australia on Twitter. Rebeccah @ The Pixie Chronicles recently posted…What happened to New Adult books? This is such a cool post! I love all the friendships I’ve made online and recently I met up with three other bloggers in New Zealand which was such an amazing experience to sort of transition from everything we’ve talked about online to being able to meet up and talk in real life like we’ve been friends forever (which we kind of have anyway). I love all my online friends (sometimes more than some of my irl friends) and I don’t actually know what I’d do without you guys because it’s actually such a big part of my life now! Aw what a sweet post! I agree, the support I’ve gotten lately from online friends has meant a lot to me lately. Bookish community rocks! I agree with this, and well said Lindsey. Especially how you articulated that a lot of book blogger/ online friendships are based on shared interests, not just proximity or whatever. Such a good point. It’s nice too to be able to make friends around the world, who have the same passions or interests. I mean I live in the US, how else would I ever connect with likeminded fans in Australia, say, or Europe or wherever? It’s so cool! And yes seeing comments from far- flung friends is always a treat! Thanks so much, Greg! And yes, it’s definitely nice to make friends all around the world who share the same interests. Not to say that offline friends can’t share the same interests, but I found it’s definitely not always the case. And I so hope you’ll enjoy Eliza and her Monsters when you get to it! Yes, exactly, that’s such a great point! Online friendships or relationships are so common these days, and it’s usually indeed the older generations who are still close-minded and judgmental about it all. This is sooo true. I’m really socially awkward and this online friendship has brought me a lot of happiness and positiveness in my life. Of course, I have friends outside that circle but they are as equally precious as my online ones. Poulami @ Daydreaming Books recently posted…K-Drama Reviews: Suspicious Partner & Healer || Ji Chang-Wook edition! Yes, exactly, I love how online friendships can bring so much to people who are socially awkward or even anxious. They are definitely not to be underestimated! Ahhh this is such an amazing post! I love that you wrote it, and I totally agree with all your points. Also, it’s not like online friendships just talk about books or whatever their shared interest is – we talk about life, too, so to imply it isn’t a real friendship is really short sighted. Thanks so much Marie! And yes, I completely agree, book blogging friends are not only helpful with the book recommendations, but are there for us for other life questions and crises 🙂 I sometimes feel like my first instinct is to talk to online friends, and only after that to offline friends, so they are definitely incredible and very real! Oh yes, I definitely think of online friendships as real friendships. I met three of my best friends that way over 10 years ago and now we meet up all the time, travel together, and they’re the first ones I run to when I have any news that I want to share or when I’m going through a rough time. I can’t imagine what my life would be without them. That’s such a great story! It’s awesome that you met such great friends online, really shows the importance of online friendships. Love it! I’m a born introvert and so my online relationships are very important to me because I am able to engage when I have the energy – and it doesn’t take as much energy from me as normal face-to-face interactions do. I love this post. Fangirling! I think that online friendships are definitely ‘real’. It’s not the physical presence of someone that counts – it’s the interactions and understanding etc. and sometimes you just can’t get all of that from the people who surround you. Maybe it’s a small town, maybe it’s the business of life not letting you meet new people, but online friendships definitely count. And… THANK-YOU for being an awesome online friend!